Time travel! It’s the stuff of movies! 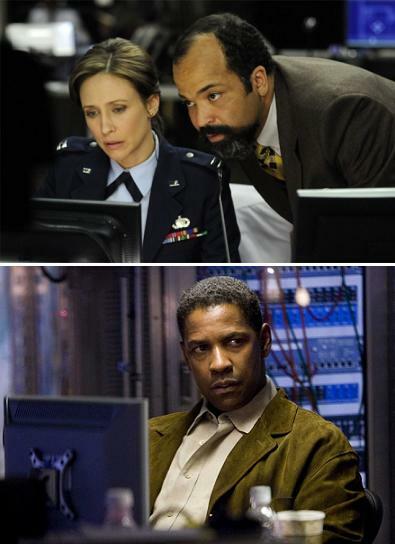 One of those movies is Source Code, starring Jake Gyllenhaal and Vera Farmiga. To be honest, I’m not much one for science-y, nerdy time machine movies. However Source Code isn’t a nerdy time machine movie. It’s less about time travel and more about people and relationships and identity. I don’t always like “thinking” movies at the end of a long day, and although any film with time travel in the plot is going to require you to pay a certain level of attention, Source Code drew me in and got me thinking about the story and the people involved, not just the mechanics and plausibility of the thing. In both films the ability to see or travel through time is developed and accessed through computers, and the nature of the time travel is quite interesting. In contrast to the traditional idea of a time machine that can just travel freely through time without limitations, in each of these films the window of time that can be accessed has very specific restrictions. In Deja Vu a “time-folding” computer program called ‘Snow White’ allows a small group of computer scientists to see the past, but only a very specific point in the past, about 4 days before the present. Supposedly one can’t “travel” to that time, but you can view it like a movie, and you can move around in space, within that point in time. In Source Code a soldier is sent back in time using a “time loop” computer program called ‘Source Code’ to also live through a very specific time: the 8 minutes preceding the bombing of a commuter train. However unlike in Deja Vu the soldier can be sent back to relive the same 8 minutes over and over ad infinitum, despite dying each time the train explodes. Although technology is used in each film to facilitate the time travel, in each case it is an amateur outsider who has to navigate the journey through time. This is a great cinematic device because it means that the protagonist is figuring out everything at pretty much the same time as the audience. Despite all their similiarities, however, the films are both different, and leave you with very different feelings. Deja Vu is all action-y and Doug has to race through time and space to save the beautiful stranger, Claire. There are lots of chases and explosions and shooting and crocodiles and stuff. While Source Code does have some of each of the above (except the crocodiles), it is a much more introspective film. I think this reflects the closed loop of time that Colter Stevens finds himself trapped in. With echoes of Avatar, Colter Stevens, a marine fighting in Afghanistan, finds himself sitting on a Chicago train in someone else’s body. After dying in the explosion he wakes back in his own body, but trapped in a metal pod with no way of getting out. An airforce captain appears on a video monitor and tells him he must find the bomber on the train, and sends him back in time with another 8 minutes to do so. In both places/times, Colter struggles to find and stop the train bomber, and also to figure out why he’s trapped in the pod and how he can escape. Source Code is a much more psychological film which causes the viewer to be more concerned with Colter, his experiences, and his increasingly desperate search for an escape. Time travel isn’t a gimic that the film is based around, but a device which facilitates the telling of an unnerving human story.